To access your Gibbon account, you need to login. The login window is available in the sidebar of the homepage of your Gibbon installation. The login screen has two main options, which can be revealed by clicking on the Options link below the password field. School Year - by default Gibbon logs you in to the current school year (e.g. 2015-16). If you want to log into previous or future years (given that you have permission), select the year here. Language - Gibbon is currently (as of August 2015) available in 7 different languages, with more on the way. To change your language for the current session, select here. Language can also be set for the whole school, as well as within your Preferences. In addition, if your school has configured it, it is also possible to login using a Google account. The Gibbon homepage for teachers seeks to give you all the information you need to do your job as an educator, in one place, with quick access to other data from around the system built right in. The image below highlights some of the main functions you can find on a fully configured homepage. Students see a similar, but slightly reduced set of functionality, allowing them to interact with the lesson plans, homework, and assessed work that you give them access to. Actions - these represent the system’s functions, such as Edit Markbook. Classes - these are academic groupings, such as Year 8 Science, class 1. To use the Fast Finder, which is located at the top right of the screen, start typing into its text box. An autocomplete dropdown will appear, from which you can select the item you are searching for. Press Go to be redirected to the desired information. Clicking on the Notifications icon (as highlighted above), takes you to the Notifications page, where you can use the icon to action and archive the notification in one go. Archive notifications drop down to the second part of the page. All notifications can be deleted in one go by using the icon above the New Notifications table. Password - reset your password to keep your Gibbon account, and your school’s private data, secure. Personal Background - override the current theme’s background image with one of your own choosing. Simply enter the URL to an image somewhere on the web. 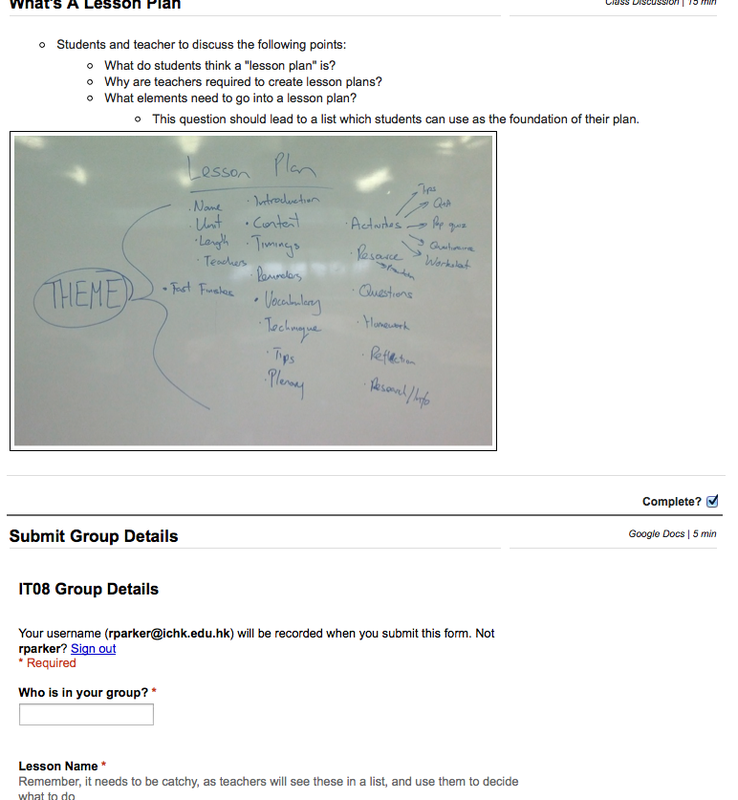 Personal Theme - override the school’s current theme with your own choice, to change the appearance of your Gibbon. Only themes installed by your school are available here. 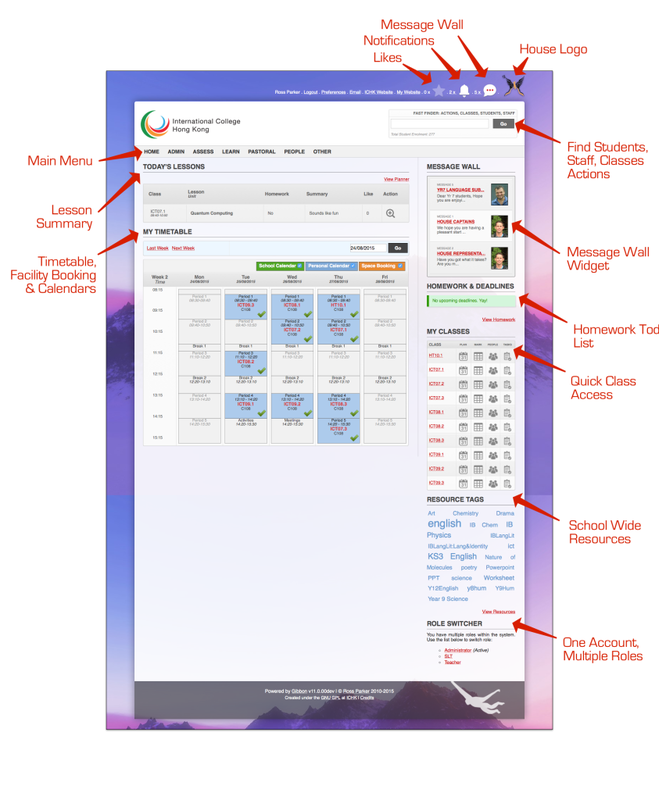 Personal Language - override the school’s default language, customising the interface to your language needs. This will be overridden, if you select a language at login. 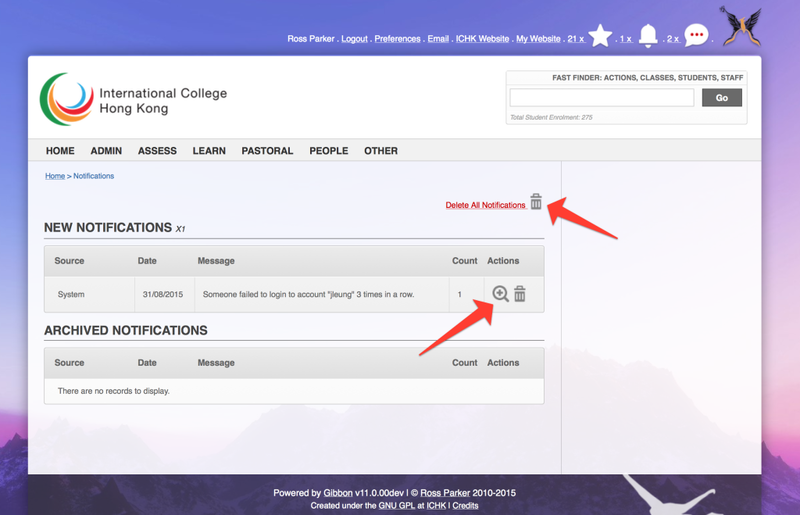 Receive Email Notifications - choose to be alerted by email when you receive a system notification in Gibbon. As a teacher, when you first log in to Gibbon, the Getting Started help box will assist you in making the most of Smart Workflow. Each of the main five links will take you to the relevant part of the system, and give you advice on how to use it. Once you have the hang of using the system, you can use the link on the bottom right to hide the help dialog. The Markbook is designed to support teachers in ongoing Assessment Recording & Reporting (ARR). 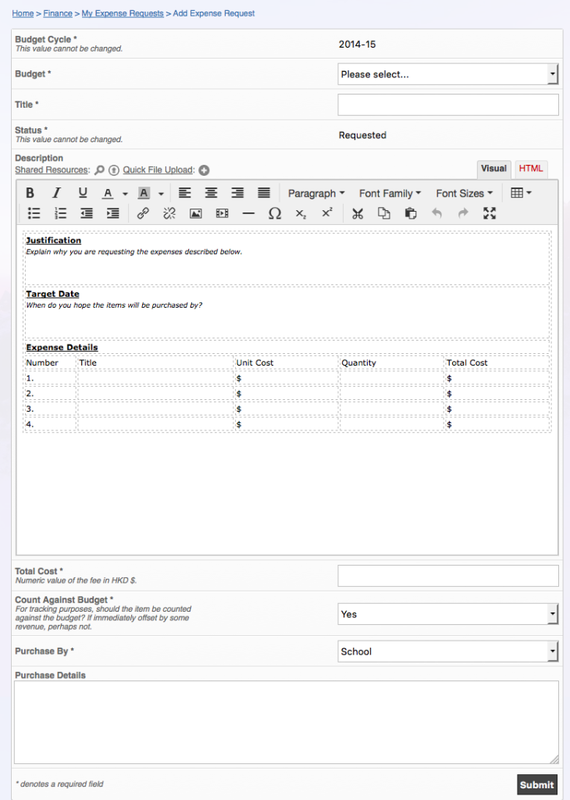 It supports the ability to create Markbook columns (either individually or in bulk) and then to enter various data (grades, rubrics, comments and uploads) for each student in a class. 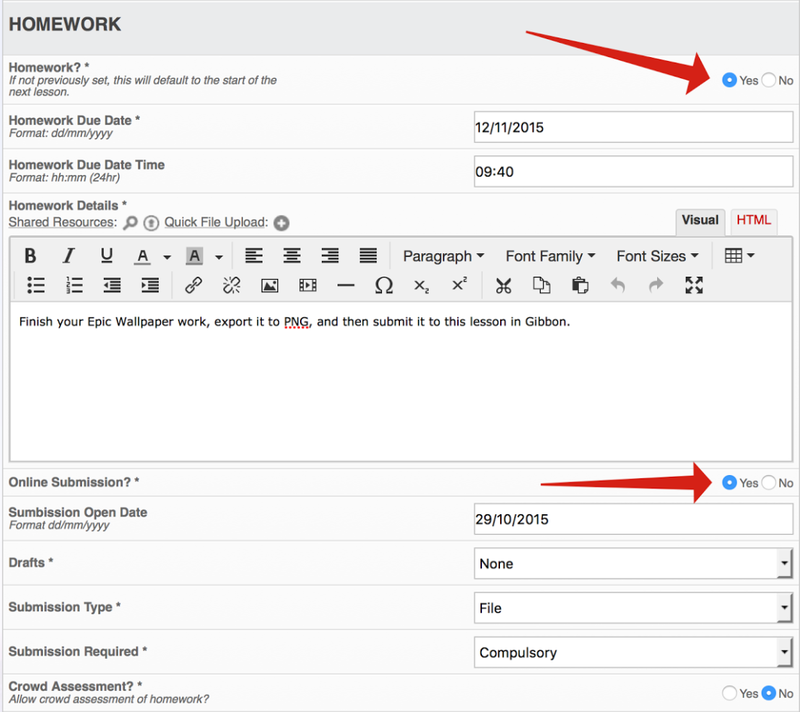 In addition, it can be linked to the Planner, such that submitted homework can be viewed during marking. Each Markbook column can optionally be shared with parents and students, allowing for pertinent results to be rapidly disseminated. 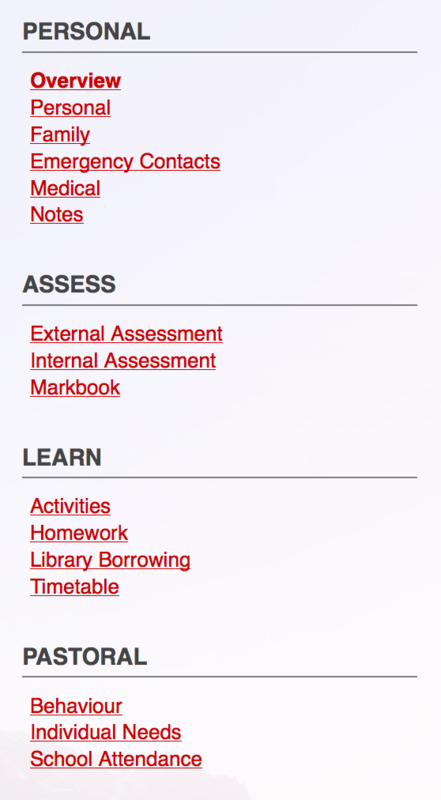 Go to Assess > Markbook in the main menu at the top of the page. Click on the Add Column button on the top right corner of the Markbook. Choose the parameters of your Markbook. Process the Submit button at the bottom of the page. Click on the Enter Data button at the top of the newly created column. Begin entering data for each student, remember to press the Submit button at the bottom of the page when finished. Crowd Assessment is like peer assessment, but bigger. When students submit work into one of your Lesson Plans, you can use Crowd Assessment to open the work up to a wider audience, who can respond with likes and comments. Your chosen audience might include class mates, other students, or even parents. Crowd Assessment - so yourself, your students and a potentially wider audience can access the work. Once Crowd Assessment is enabled, the work can be accessed by going to Assess > Crowd Assessment in the top menu bar. Each lesson remains visible in the Crowd Assessment listing for 6 weeks after the lesson took place. 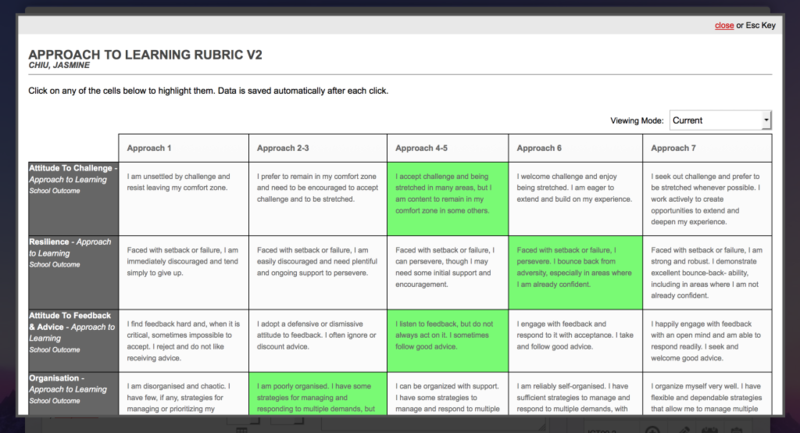 To use the rubric, simply click in the cell you wish to select. There is no need to save the rubric, as this happens automatically. When it comes to planning, teachers have an almost infinite number of ways to do things. Gibbon tries to avoid tying you down to a particular approach, but instead seeks to give options. In starting planning you have an incremental range of approaches, each additional level of which represents an increase in upfront investment of time, but each of which saves time in the long run. Before commencing planning, whether it be as an individual, a department or a whole school, it is worth understanding the different approaches available to you. Just Lessons - when you click on the “Planner” icon anywhere in Gibbon’s interface it takes you to the Lesson Planner, which is the quickest way to get started. In this approach you create lessons for each class (e.g. SC10.1 or Year 10 Science, Class 1). Each lesson is an independent entity, so there is little structure over a course. Simple Units - as well as the Lesson Planner, Gibbon includes a Unit Planner. The quickest way to get going, is to create a simple unit, and then, when creating lessons, specify that the lesson belongs to the units. Now you have some structure within your course. 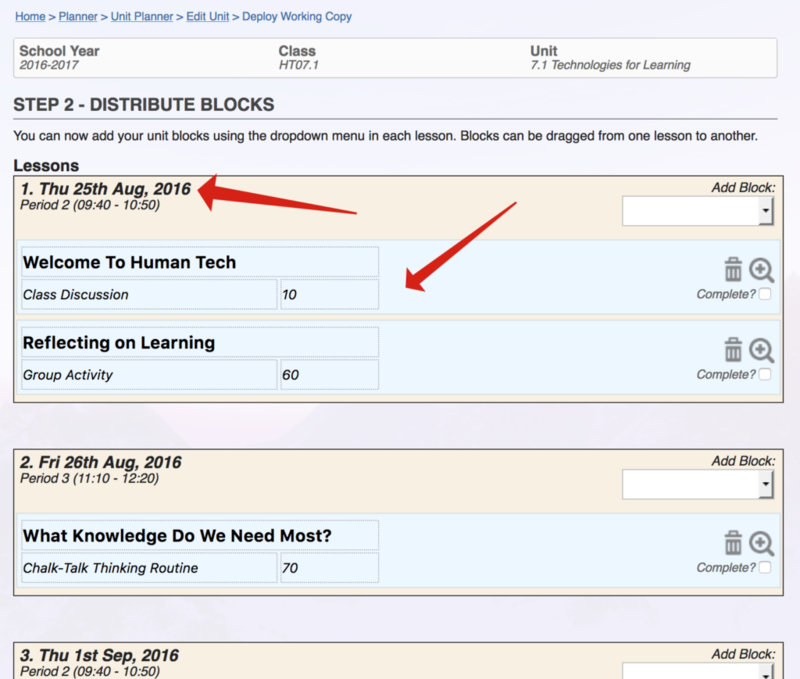 Smart Blocks - the problem with approach 2 is that all your content is stuck in your lessons, making it harder to reuse in different classes, courses and school years. The solution is to store your learning content in Smart Blocks, which exist within the unit. Blocks can be stacked, dragged and drop, and can have their contents shown or hidden. Once blocks are in a unit, they can be deployed to a class very quickly, allowing detailed lesson plans to be produced in a few minutes. View/edit lessons by date or class. View complete year overview for a class (useful for medium-term planning). Share lessons with students and/or parents. Embed rich content into your lessons. Assign, collect and mark homework (via the Markbook). Quickly see summary of students in class, their individual needs, medical conditions and more. Take class attendance, and compare to school attendance. Threaded chat to engage teachers, students and parents in discussions. Use the Choose A Date or Choose A Class menus on the right-hand side module menu. Use the Add button to start creating your first lesson plan. 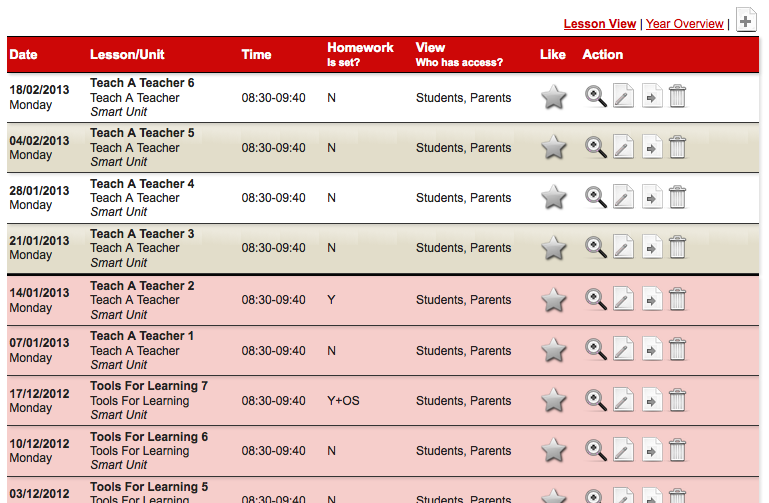 Alternatively, use the link to Manage Units, create a Smart Unit, and have your lessons created automatically for you. Units provide a way to group lessons into logical groups, and so help keep curriculum details organised and easy to access. 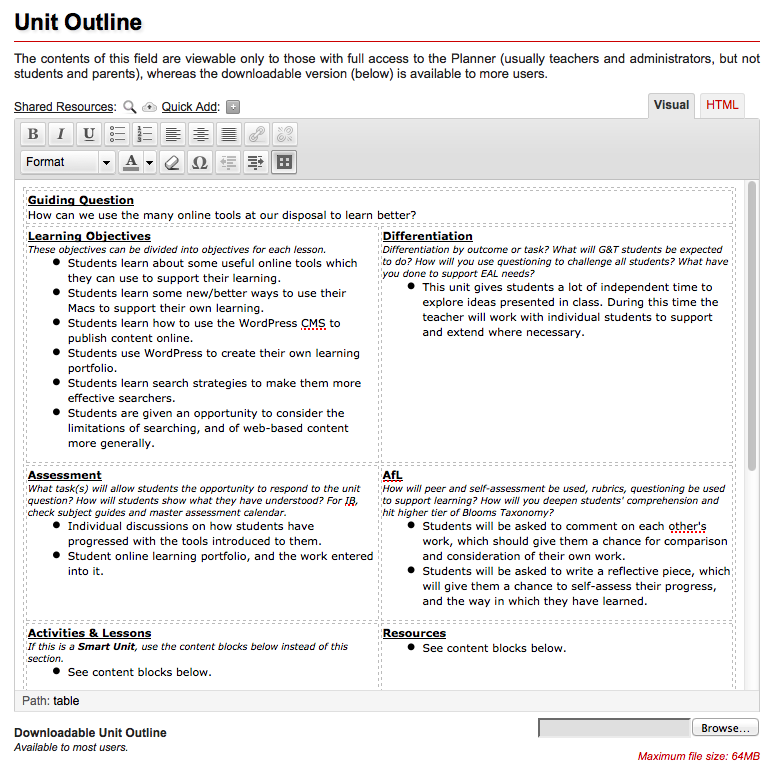 In addition, units can store unit outline information, with the option of school-wide templates to allow for some standards in planning (see screenshot below). Organisationally, Gibbon uses a hierarchical structure to keep content, people and workflow organised: Departments, Courses, Classes, Units. Departments - used to group staff together, and assign them roles which determine ability to edit and view curriculum content. Courses - the largest unit of learning, and are designed to contain a number of classes. Classes - different groups studying within one course, classes split users into different roles (Teacher, Student, Assistant, etc). 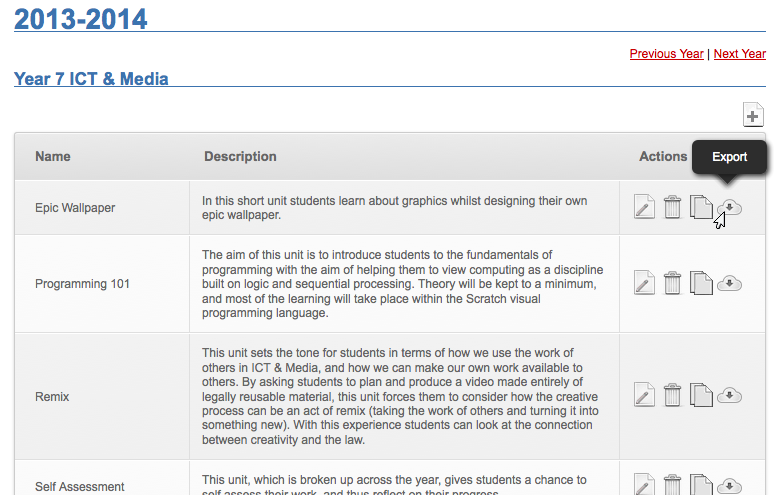 Units - units are attached to courses, and can be used at the class level to organise content. Units can be copied between courses and between years. Smarts Blocks are a part of Gibbon’s units and are designed to ease the planning burden that all teachers face. Units are reconceived as a set of individual content blocks, each of which might represent an activity, outcome, resources or discussion point. 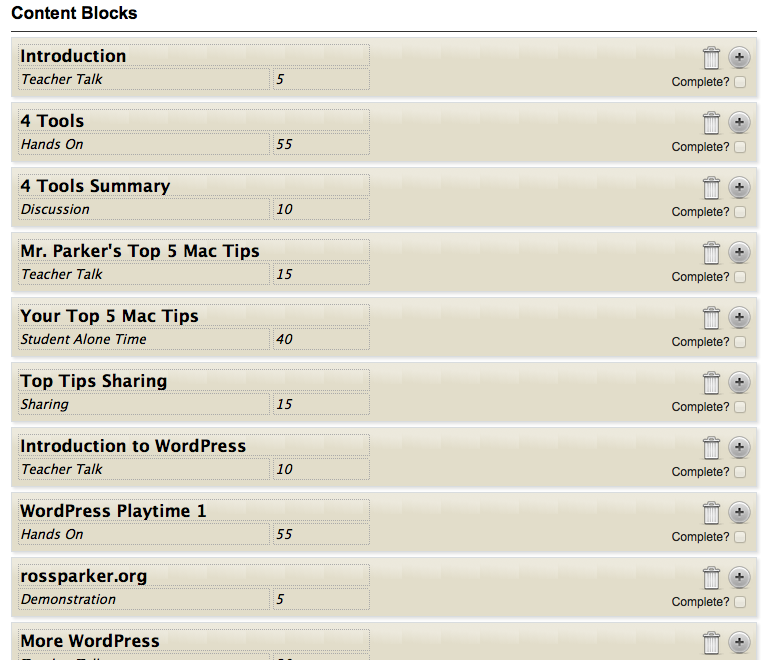 Blocks are assigned times, and can then be quickly deployed into a class, across a number of lessons. Once deployed, blocks can be easily edited, dragged between lessons and removed. The result is an intuitive, time saving planner, which promotes collaboration, reuse and continuous improvement. Select Manage Units link in the right-hand side module menu. Use the Add button to start creating your first unit. Whilst working on your first unit, decide whether you wish to create a Smart Unit or a Basic Unit. Units that contain Smart Block content can rapidly be deployed to create a set of lesson plans. The content of these plans can be amended or added to quickly at any time, with new lessons being added as needed. Go to Learn > Planner in the main menu. Click on Unit Planner in the module menu (in the sidebar). 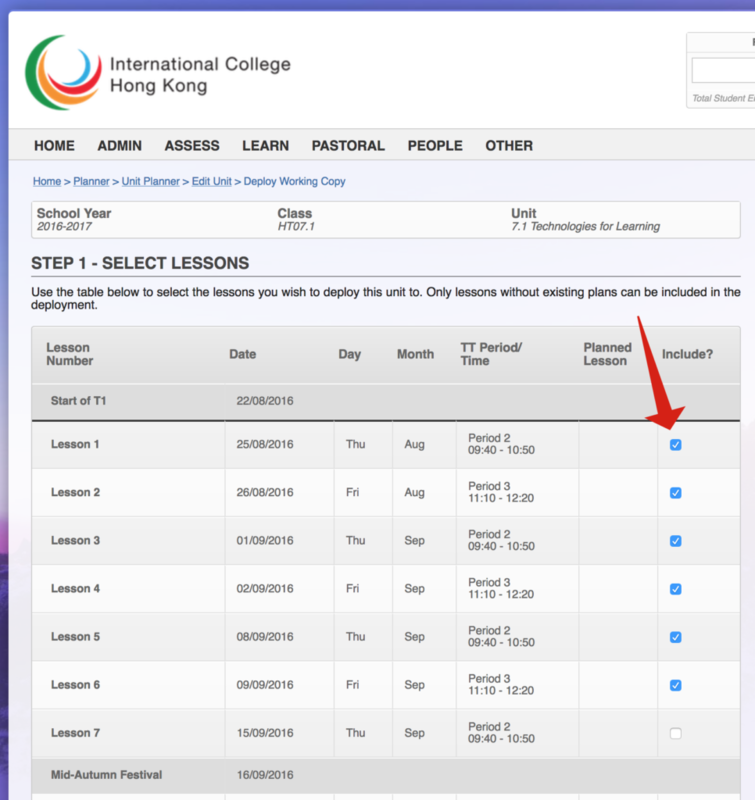 Use the Choose A Course drop down menu in sidebar to select the course containing your unit. Click on the Edit icon against the unit you would like to deploy. Once the unit loads up, scroll down to the Classes section, and set those classes you want to deploy to Yes in the Running column. The icons under the Actions column will appear once you press the Submit button, and the page reloads. Now click on the Edit icon against the class you would like to deploy to. In the final step, you will see slots for the new lessons, and, if your blocks have timings, they should be prefilled with content. Remember, you can reorder blocks within a lesson, or move them to other lessons, by dragging and dropping them. 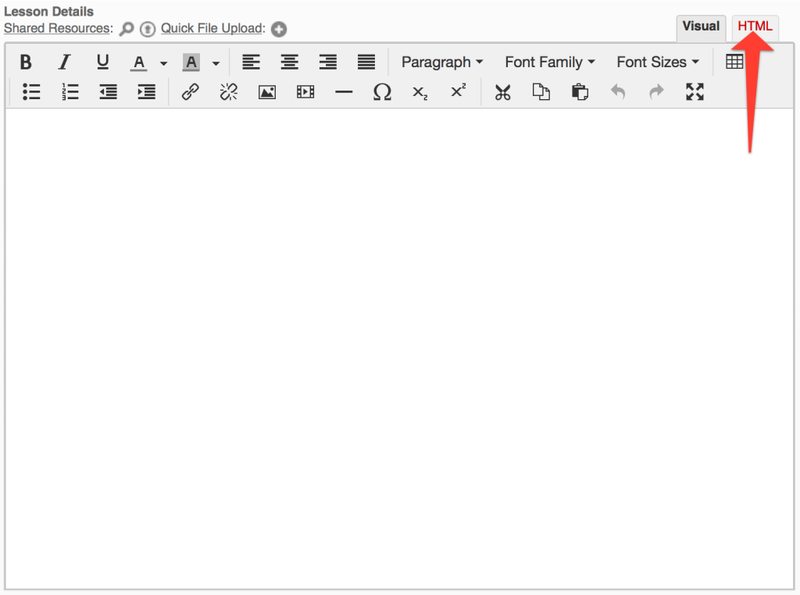 Once finished, press the Submit button to create your lesson plans. If you are leaving your current school, which uses Gibbon, and wish to take your units with you, you can use the Export feature to output your unit onto the screen. From here, you can save the HTML using your browser, or copy and paste the content into a document of some kind. Use the Unit Planner link on the right-hand side module menu to enter the units section. 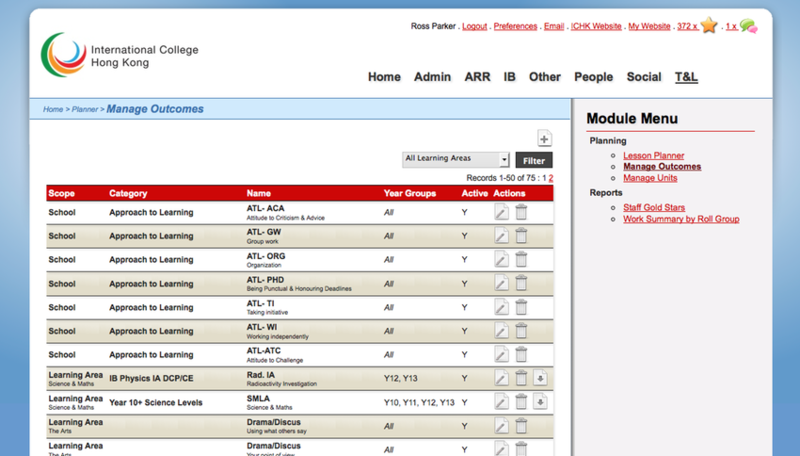 Use the Choose A Course drop down menu on the right-hand side to select the course in which your unit lives. Finally, either use your browser to save the page as HTML (recommended), or copy and paste your work to a document (e.g. Word, Pages, Google Drive). The Timetable provides teachers with an easy way to find staff and students during the school day. Your own calendar can be integrated with Google Calendar, to give you an all in one display of your day, right on your home page. You should see your own timetable on your home page. 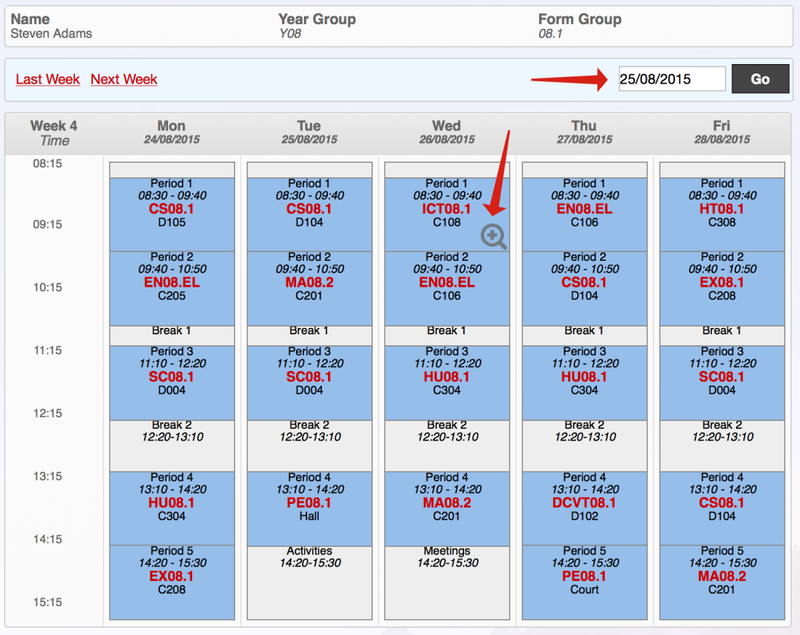 To view timetables for staff or students, go to Learn > Timetable in the main menu. Select or search for the person you are interested in. The magnifying class shows that there is a lesson plan attached to this class: click on it to view the lesson. The text below gives a brief description of how the Behaviour module functions to support pastoral care in school. To get started, go to People > Behaviour in the main menu. The behaviour modules maintains a set of behaviour records for students, where each record is one event or behaviour. Events can be either positive (x helped y) or negative (x hit y). When a negative event is recorded, the students’ form tutor will be notified. Events have descriptors, which are like main categories (e.g. Being Nice, Helping Others, Working Together for positive, or Hitting, Fighting, Swearing for negative). These descriptors can be easily customised (or turned off all together) under Admin > School Admin > Manage Behaviour Settings. Events have levels, which say how severe something is (e.g. Level 1, Level 2, Level 3). These levels can be easily customised (or turned off all together) under Admin > School Admin > Manage Behaviour Settings. The teacher adding the record can do so for one student, or a group of students together. When adding the record, an initial comment on the incident can be made. This can be added later, or follow up information can be placed in an individual box. 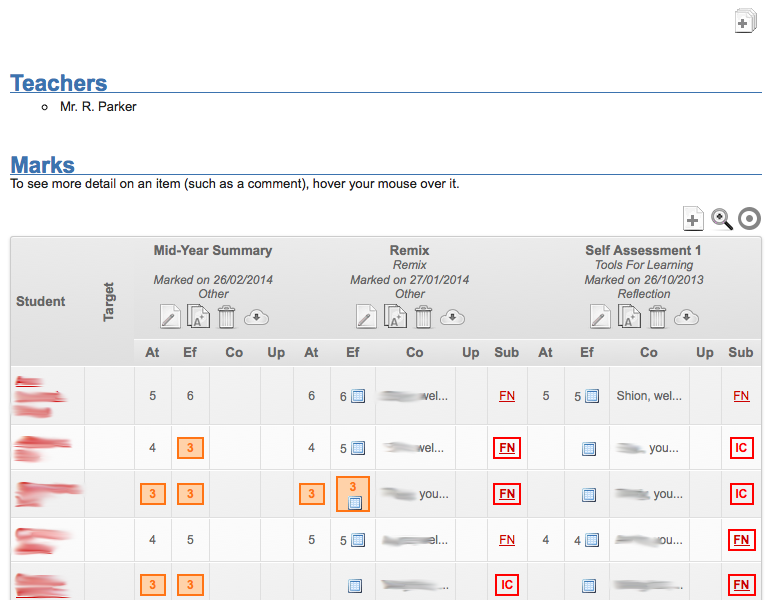 Form tutors see a summary of recent behaviour for their form on the home page. A behaviour summer of each student is given in the behaviour module, and in the student profile. There is a pattern spotter, for seeking particular types of behaviour. Gibbon, being a combined school information management system (SIM/SIS) and virtual learning environment (VLE) collects and collates a lot of information on each student. As one of its key aims, Gibbon seeks to make this information available in an easily accessibly and clear fashion. This is achieved via Student Profiles, which are accessed via the Students module. Go to People > Students in the main menu, then search and then select the desired student. 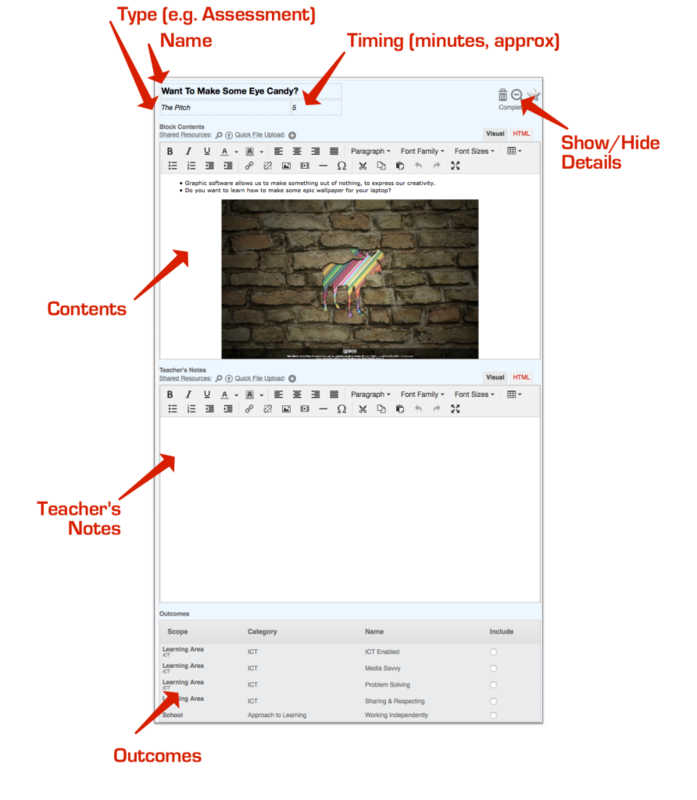 Use the Fast Finder in the page header, and start typing the students’ name. Select the desired student from the drop down menu, and press Go. 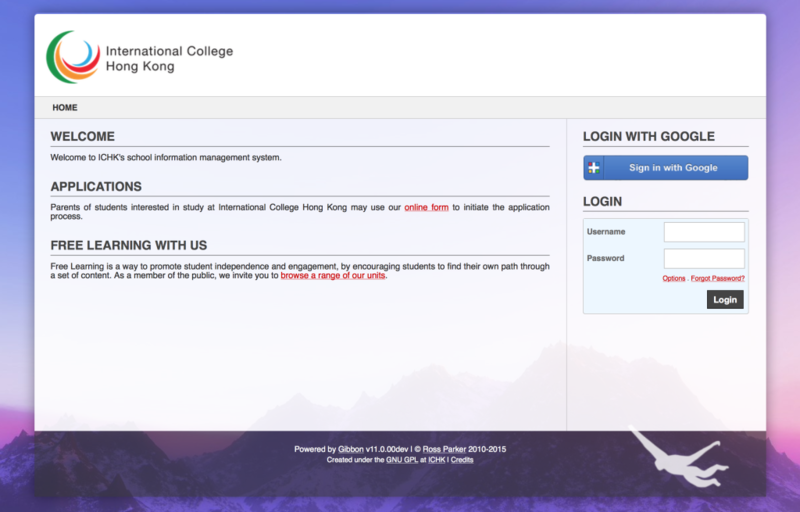 Click on a student name almost anywhere in the system: most instances of student names are links direct to the relevant part of their profile (e.g. clicking on a student name in a class markbook, will take you to that students’ academic results. Budget Level Expense Approval - determines whether there is budget-level approval. If enabled, one of the staff members with Full budget access is required to approve a request, before school-level approval occurs. One Of - only one of a group of school-level approvers need to approve an expense at the school level. Two Of - two of a group of school-level approvers need to approve an expense at the school level. Chain Of All - all school-level approvers need to approve an expense, in a certain order. Once final approval has been given for an expense request, the originating user is notified of its approval, and the purchase can be made. Depending on options selected along the way, a purchase officer or reimbursement officer might also be notified during or after this process. Go to Admin > School Admin in the main menu at the top of the page. Select Manage Finance Settings in the module menu. Scroll to the Expenses section, and set the required options for your school, to get the approval process of your liking. 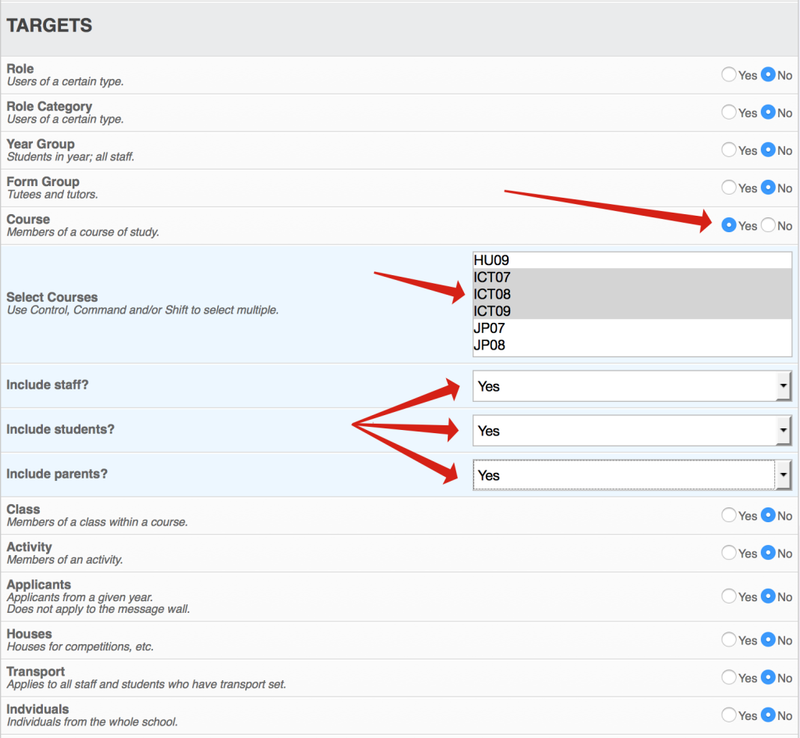 Use the add button to specify those users who have school level approval rights. Once users being making expense requests, the relevant budget and school level approvers will begin receiving notifications for their approval. Expenses require approval before they can be made against a budget. Use the introductions below to make a request against a budget you have access rights to, and you will receive notifications as your request makes its way through the approval process. 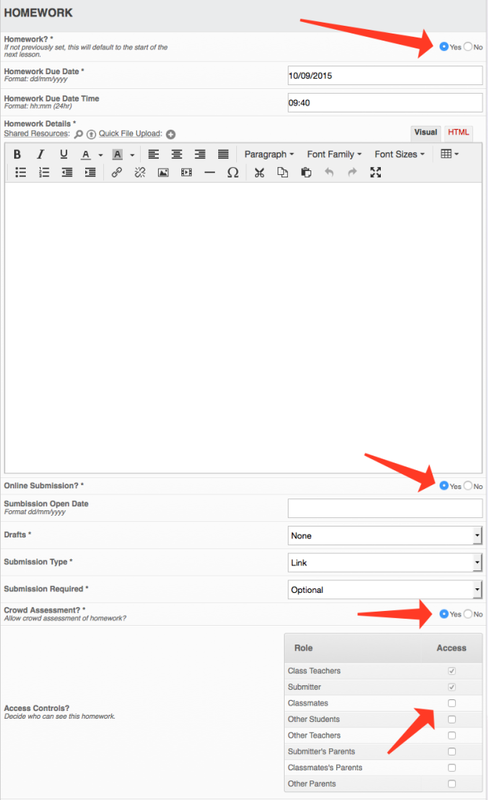 Use the add button to create a new request, filling in all required fields. You can only make requests from budgets that you have access rights to. If you set Purchase By to “School”, and your school has nominated a Purchasing Officer, that person will be notified to make the purchase once final approval has been granted. Go to Other > Messenger in the main menu at the top of the page. Use the Add button to start composing a message. Enter a subject and message body. Choose recipients in the Targets section (see below). 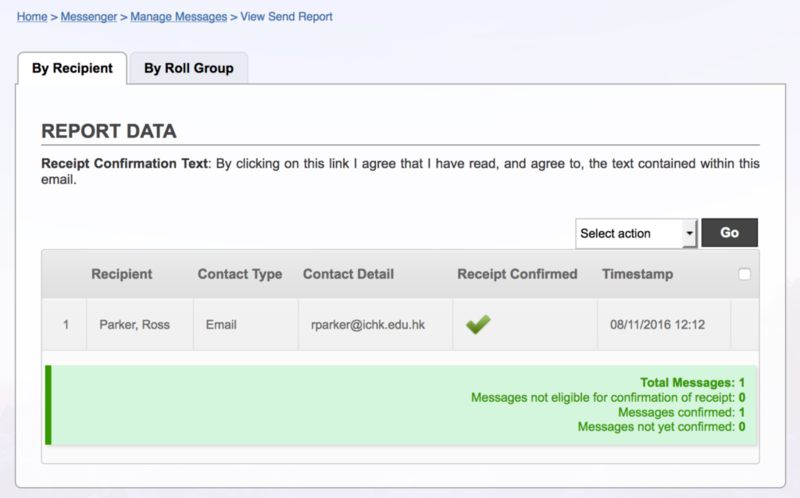 When properly configured, Gibbon knows a lot about your school, making it possible to send messages out to numerous different targets. In the example below, a message is being sent to all students, staff and parents associated in Years 7-9 ICT. It is always worth double checking your messages before sending, as you are potentially sending the same message our many times over. As of v13 (due for release January 20th 2017), Gibbon supports read receipts for messenger emails. Click here to learn more.